A man walks into a tapas bar. Well, actually, three men: Marc Vidal, Yann de Rochefort, and Zack Bezunartea, all coming to pay homage to Spanish cuisine and a city they love: Barcelona, Spain. Vidal, the executive chef, attended a restaurant school at 16, inspired by his family’s Barcelona restaurant. De Rochefort, a former marketing executive, is the visionary behind Boqueria, while Bezunartea, Director of Operations, oversees all six restaurants in New York and D.C. The first of their highly successful restaurants opened in 2006 in New York. La Boqueria, the bustling market in Barcelona, opened centuries earlier and serves as an inspiration. The restaurant brings the beauty of Spanish cuisine, the flavors and freshness of ingredients, along with Barcelona’s history and energy to an American audience. The shared experience of tapas, a panoply of food, drink, and conversation uniquely Spanish, often quite magical. 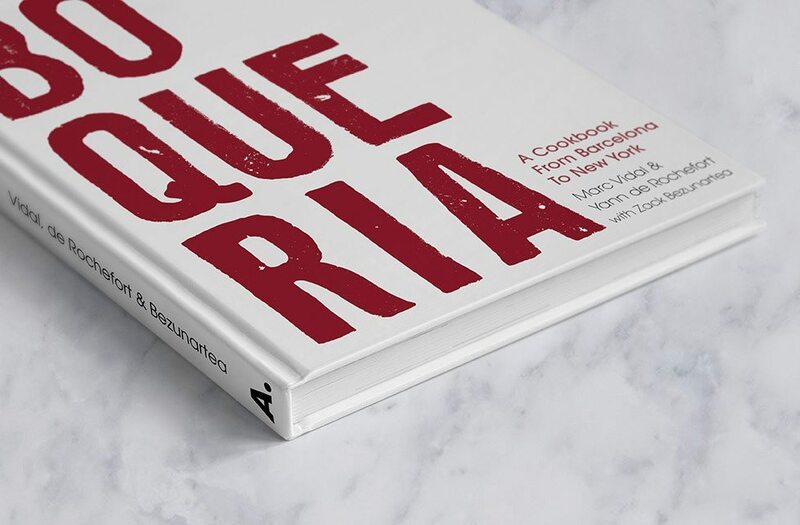 And this magic is now yours to make at home with Boqueria: A Cookbook from Barcelona to New York. You will happily find the greatest hits of tapas in the book: pan con tomate, patatas bravas, croquetas, and pimientos de padron. You will be thrilled with maiz rustido: sautéed corn with hot paprika oil and manchego cheese, which will be my new summer grill side-dish. The recipe is simple and delicious: grilled summer corn-fused with the flavors of Spain and just a suggestion of heat. Boqueria focuses on fresh, seasonal ingredients, just like its namesake market. Mejillones con Azafran, steamed saffron mussels, are laced with saffron, sherry, garlic, and thyme. The dish is inspired by the flavors of paella, and suggests serving the mussels with a good bread to sop up all the juices. I can attest this is an excellent suggestion. Carne à la plancha, or seared hanger steak with “mojo verde,” is sure to become a family standard. Seasoned with garlic, rosemary, and thyme, the steak can be cooked in the oven or grilled and is served with crisp fingerling potatoes, blistered Padron peppers, and the mojo verde sauce, a vibrant mixture of herbs, garlic, cumin, and sherry vinegar. If you have any room left, there is an excellent dessert chapter that includes everyone’s favorite, crema Catalana, the delectable caramelized citrusy custard. Save room. Boqueria brings you Barcelona on a plate, thoughtfully written and beautifully photographed. Spain’s Canary Islands sit just west of Africa in the path of the heavy trade winds that shape Morocco’s western Sahara. The proximity of North Africa shows in the cuisine of the volcanic islands where local marinades, “mojos,” laced with heady spices, flavor meats and stews. 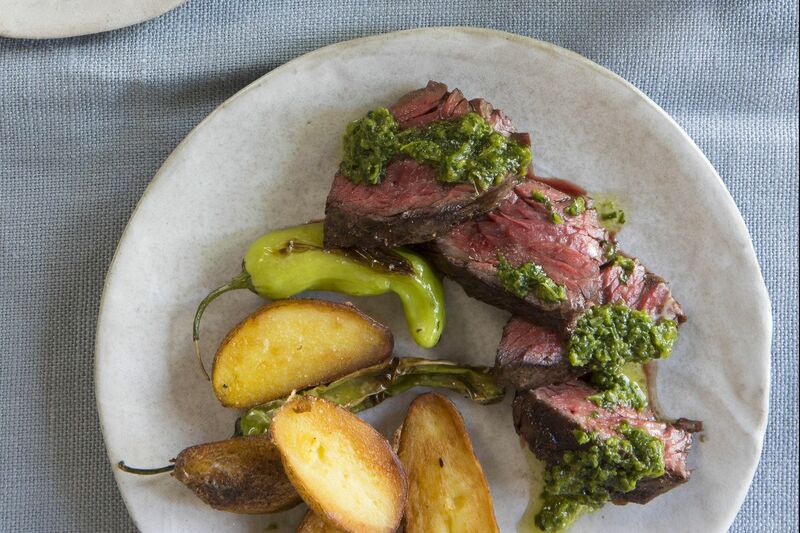 The garlicky green version we use here can bring any meat dish to life but goes particularly well with a classic combination of seared steak, potatoes, and peppers (we, of course, use shishitos for an extra bite). Rub a thin coating of oil all over the steak and then rub with half of the crushed garlic and 1 sprig each of rosemary and thyme. Cover and let stand for 30 minutes at room temperature or refrigerate overnight. If chilled, let stand at room temperature for 30 minutes before cooking. Place the potatoes, remaining garlic, rosemary, and thyme in a small saucepan. Add enough cold water to cover by 1 inch and generously salt the water. Bring to a boil over high heat. Cover, reduce the heat to medium, and simmer until a cake tester or knife pierces a potato easily. Drain well; discard the garlic and herbs. When cool enough to handle, halve each potato lengthwise. Scrape the garlic and herbs off the steak and discard. Generously season the steak all over with salt. Let stand for 10 minutes. Heat a large, heavy ovenproof skillet over high heat. Add the steak and cook until well seared, 3—4 minutes per side. Transfer to the oven and roast for 5 minutes for medium-rare. Remove from the oven, transfer to a cutting board, and let rest for 5 minutes. Meanwhile, heat a large nonstick skillet over high heat. Coat with oil, then add the potatoes in a single layer cut sides down. Cook, shaking the pan occasionally, until the bottoms are lightly browned, about 3 minutes. Scatter the peppers around the potatoes. Generously drizzle the peppers with oil and season with salt. Cook for 2 minutes, carefully but thoroughly toss everything in the pan, and cook for 2 minutes more. The potatoes should be dark brown and the peppers should be blistered and soft. Transfer to paper towels to drain. Generously season the steak with pepper. Cut into slices and serve with the potatoes, peppers, and mojo verde. Combine the cilantro, parsley, garlic, pepper, and cumin in a food processor. Pulse, scraping the bowl occasionally until everything is chopped. With the machine running, add the oil in a steady stream, then add the vinegar. You want the mixture to be coarse without any large chunks. Pulse more if needed. Season to taste with salt.